Diving at Hin Daeng on liveaboard diving trips is excellent. Being located far from any other land or islands and surrounded by deep sea means that Hin Daeng is a haven for hundreds of species of marine life, including hundreds of thousands of individuals. Most species spend their whole lives here, but larger fish visit Hin Daeng to find food or be cleaned. The sea all around is deep for many miles, meaning that nutrient-rich cooler water supplies Hin Daeng with everything it needs to become and remain a healthy marine oasis. The water is usually very clear & clean as well. The peak of Hin Daeng almost touches the surface at low tide, and all of its sides are covered with lots of corals, especially red & purple soft corals. This is most likely how it got its name. There is something for divers to see at depths from just a few metres below the surface all the way down to more than 50 metres, which is deeper than most recreational scuba divers are able to go to. Different species can be found at different depths, and these include lots of interesting bony fish & invertebrates. Divers at Hin Daeng need to look out for life within the corals and rocks but at the same time keep an eye out for something large that may visit. 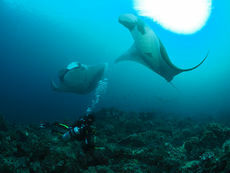 Manta Ray at Hin Daeng scuba divng liveaboardThese include Barracuda, Tuna, Manta Rays and Whale Sharks. These larger fish are often seen at Hin Daeng, but never guaranteed. The remote location in deep water, and in exposed sea far from the mainland or any other island means that the location is perfect for some awesome scuba diving. Also, because it is far away from everything else, not many scuba diving boats visit Hin Daeng. Daytrip boats usually come from Phi Phi, Koh Lanta or Phuket, but the best way to dive at Hin Daeng is to come by scuba diving liveaboard. Not only does this enable you to dive more than twice, you’re guaranteed to be there when the day trip boats aren’t for your early morning and sunset dives. Also, Thailand liveaboard diving boats that visit Hin Daeng only do so while on a ‘Southern Andaman cruise’ and not on a Similan liveaboard trip. This means that very few boats are at Hin Daeng on most days, and it’s likely that there’s only one. 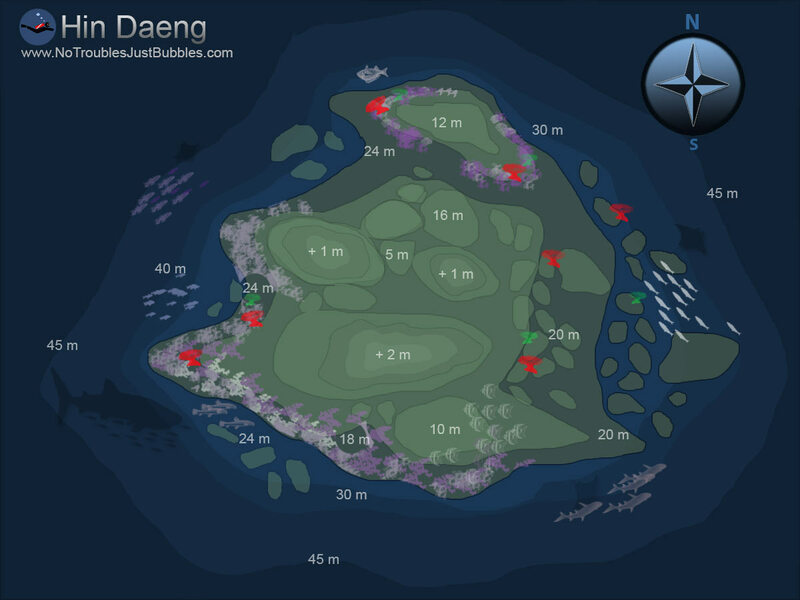 Also, just 200 metres away from Hin Daeng is Hin Muang, and equally-wonderful dive site with a very deep & steep wall. When compared to places like Richelieu Rock that are always full of divers, it is really nice to dive at Hin Daeng. In summary, the remote location in deep water ensures that there is plenty of marine life, very few other boats, and the water is usually crystal clear. Hin Daeng’s remote location also brings disadvantages. With no land or other islands anywhere near, it is rather boring for the necessary surface intervals because there’s no beach to visit or anything to look at. Also, there is no protection from any wind or waves, meaning that the surface of the water can be a bit choppy, as can journeys there. As for the journeys to Hin Daeng, other than liveaboard diving boats that can sail through the night from Phuket or maybe Koh Haa, the day trip boats need be speedboats and the crossing is long, fast and often bumpy. However, if Hin Daeng didn’t have these disadvantages, maybe it would become more popular, and therefore too busy. This would likely affect its appeal, and possibly the natural environment that divers come to enjoy.